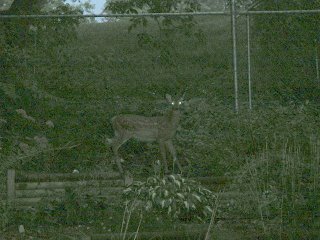 Now, I took this at 8am but it was overcast and trying to rain so there was just no getting a "good" shot but there are 3 of them, 2 doe and a fawn in the back yard staring at the fence, probably asking each other "what the hell?" I had to take a few steps off the deck to get this shot and they were not so impressed with my presence, no big shocker there. One doe, immediately leaps the fence you see from where she was standing. 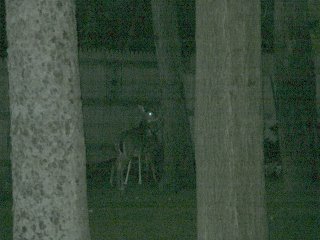 The other doe and the fawn dart to the far corner of the yard with the doe leaping the chain link thats on the other side. The poor fawn, however; couldn't jump so well so I had one very unhappy fawn trapped in the yard.